Talent is becoming a critical component and differentiator for GICs as enterprises embark upon their digital journeys. How are GICs stepping up to address the need to transform and create future-proof talent management models? This analysis will look at how GICs can identify, develop, and retain skills critical for future service delivery, including best practices for building agile delivery teams and enabling talent management processes, how to create the right employee experience for the future, and how the GIC can maximize the ROI on talent investments. Can a robot replace a human? In some cases, absolutely yes. And many pundits suggest we are just beginning. But where does the hype diverge from reality? The rise of next-generation technologies, such as mobility, analytics, cloud, automation, and other enabling technologies, offers GICs a unique opportunity to drive their enterprises’ digital agendas. Your IT organization must be ready to reinvent the enterprise through digital technology that dramatically alters their customers’ experience and their business processes. To do so requires first a reinvention of the IT organization itself. Our Pinnacle Model research identifies and details what the best, or Pinnacle, enterprises are doing to achieve outstanding outcomes. – How are GICs driving impact through analytics, and how are they measuring impact? – Which operating and organizational models are most successful? – How are GICs building the right talent and technology capabilities to become analytics COEs? Digitally-driven CX strategies seek more impactful engagement with customers via their contact centers. Smart utilization of a contact center outsourcing (CCO) model can accelerate the path to achieving industry-leading customer experiences. How do leading CX enterprises approach their CCO engagements to achieve these outcomes? As enterprises rotate more of their business to digital models, leverage data more aggressively than before, and create more intimate engagements with customers, the security threat has moved from an IT issue to a board-level imperative to protect the firm. 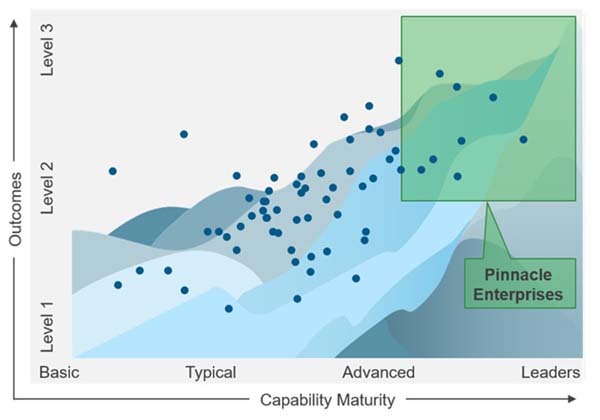 Our Pinnacle Model analyses help organizations gain deep insights into where they are on the path to realizing strategic objectives and increasing holistic value. Our Pinnacle Model analyses go far beyond dots plotted on a chart. We understand and believe that executives need relevant context to make informed decisions that result in short- and long-term success. In our analysis of input from executives from leading Fortune 1000 companies, we compare outcomes to associated capabilities – detailing implications, priorities, and trade-offs.